Proudly providing pharmacy services to students, staff, faculty & your families. Our pharmacists can prescribe prescription medication for over 25 minor health conditions, including birth control, emergency contraception and cold sores. Walk-ins welcome. 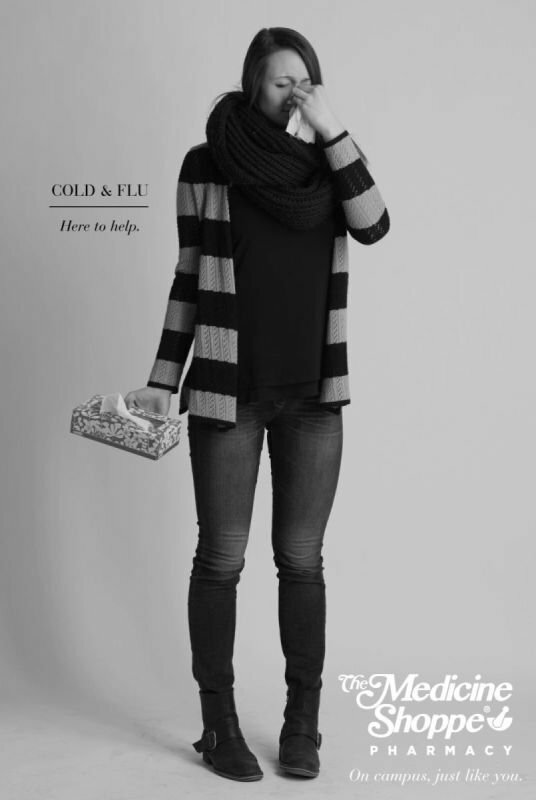 We offer annual flu shots mid-October until early spring each year. Publicly funded flu shots are available if you are 5 years old or older and have a valid Saskatchewan Health number. Everyone is welcome. We offer FREE prescription delivery within Saskatoon and FREE Canada-wide prescription mail-out. We are able to administer most deloid SC or IM medication injections in our pharmacy. You must have a valid prescription for the medication. Ask us for details. We offer FREE fittings for compression stockings. The USSU Student Drug Plan reimburses 100% for 2 pairs of stockings per academic year with a prescription. Many private insurance companies reimburse for 4 pairs per year. Ask us for details. If you take multiple medications or have difficulty remembering to take your medications, considering asking us about blister packaging. We offer weekly or monthly blister packaging for your medication for no additional charge. We encourage athletes to ask our pharmacists before taking over-the-counter medication, so we can ensure the medication is permitted in your sport. Our pharmacists also may be able to provide skin checks with documentation. We realize medication can be expensive. Our staff help you access medication coverage through the USSU Student Drug Plan, Sask Health Special Support Program & all other major insurance plans. Request your prescription REFILLS 24/7 online or by phone using your prescription number. You can also refill your prescriptions, order new prescriptions, and search our drug information database using the Medicine Shoppe Canada app. Using the app, you can send us a picture of your NEW prescription and simply bring the original prescription when you come in to pick up. If you need your prescription delivered, mailed-out or ready in less than 24 hours, just send us a message in the comments. Save time by ordering your prescriptions in advance!